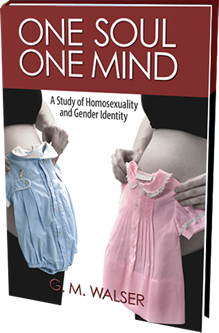 One Soul/One Mind: A Study of Homosexuality and Gender Identity (Brown Books Publishing Group) is G.M. Walser’s compelling story of a mother's involvement with human experiences and how she has dealt with the struggles that life inevitably presents. In this candid memoir that is as much about her loved ones as it is about her, Walser effectively provides a discovery of one aspect of human nature through diligent study about homosexuality and gender identity. For more than twenty-five years, Walser has made it her mission through a private research study to gather evidence that would account for her second daughter's gender differences. What Walser has found, and which she explores in this groundbreaking book, is that many parents, even without knowing it, are responsible for gender differences in their own children. What on Walser's part were hunches or intuition in the beginning have since been supported by documented cases she has researched. "All I can say is that my intuition must have come from God through prayer," Walser says in the introduction. "I now realize that my daughter is the source of all the insights that have changed my life for the better. . . . I thank her for all the love and support she has shown me in my struggle to survive." One Soul/One Mind is a book that all women and men, especially parents‐to-be, regardless of what part of the world in which they live, should read and talk about. It is a book that will make sense of the connection with our biology, with God, with each other, and with the universe. "My motivation in writing this book about gender identity and homosexuality in general is to promote respect, empathy, and acceptance for people who are at risk for violence, abuse, and exploitation."